Analysis of farm produce for phytosanitation & residue analysis. 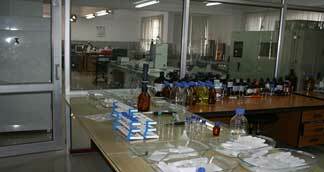 Equipped with Nitrogen analyzer, AAS, UV Spectrophotometer and Flame Photometer etc. Capacity: 10000 samples per annum. Seed processing capacity 2 tons/hr. Used for processing of about 15000 q quality seed. Research activities in the university are funded by the state government, Indian Council of Agriculture Research and other agencies. Currently there are 13 All India Coordinated Research Projects (AICRP) viz. Soybean, Rice, Pigeanpea, MULLaRP, Wheat & Barley, Chickpea, Sugarcane, Linseed, Potato, Water management, Integrated farming system, NSP-BSP and Arid zone fruits, funded by the ICAR to address issues related to crop improvement, natural resource management, production and protection management and seed production of major crops. In addition 4 volunteer centres of ICAR and other projects of RKVY, NAIP, NHM, DST and Private sectors etc. are also in operation at various constituent units of the university. System of rice intensification for input and water saving. Intercropping systems chickpea + mustard (6:2) and linseed + chickpea (4:2) for limited irrigation conditions. FIRB system for wheat + lucerne, BBF system for soybean, irrigation management technologies including drip irrigation in potato, coriander, garlic, onion and cabbage. INM modules for lentil, rajmash, fieldpea, pigeonpea, linseed, sugarcane and pigeonpea + soybean, soybean, chickpea, wheat cropping sequence. Weed management in rice, soybean, fieldpea, rajmash and wheat through post emergence application of herbicides. Organic farming package for soybean-wheat and soybean-coriander cropping sequences. Technology to prevent stunting in coriander. Integrated Pest Management modules for control of green semilooper, tobacco caterpillar & girdle beetle in soybean, pod borer in chickpea, bud fly in linseed, aphids in mustard and stem borer, leaf folders & hoppers in rice. Integrated Disease Management modules for control of leaf & neck blast in rice, pod blight & bacterial pustules in soybean, Cercospora leaf spot, powdery mildew & leaf crinkle in mungbean, collar rot in lentil, linseed and chickpea, stem necrosis, black scurf & late blight in potato, alternaria blight in linseed and phyllody in sesame. Recognized as one of the major producers of breeder seed in the country. Produces about 540 tons breeder seed of wheat, soybean, chickpea, rice, vegetable pea, coriander, mustard, fenugreek and linseed. The Directorate of Extension Education (DEE) is the chief nodal agency functioning through its sub-units i.e. six Krishi Vigyan Kendra and in close co-operation with the constituent units of the University. Training : Imparted fifty two trainings to trainers (138) and farmers (2296) under special programme on “scaling up of water productivity” and four trainings to the farmers (200) under Tribal Sub Plan (TSP) by research scientists.